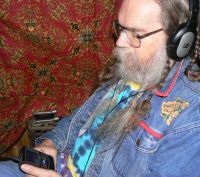 Many of the songs I play on Something Blue are available as free and legal downloads. These songs are often found on The Live Music Archive or Delta Boogie Radio. Follow the provided link to download the songs. On the Mixcloud widget there is a share button that looks like a box with an arrow. Click this button to share the show or embed the show on your blog or website. After you click the share button you will see icons for Facebook, Twitter, Email, Google Plus, and Tumblr. There is also an icon that looks like this, &LT;&GT;, for embedding the show on your site. You can also share the entire post. Click Continue reading and scroll down to find icons for many social sharing sites. Paste this code onto your blog or website to turn your readers on to Something Blue.